Abstract: Objective To investigate the distribution of divalent metal transporter 1 (DMT1) in the cerebellum of APP/PS1 transgenic mouse.Methods Immunohistochemistry, immunofluorescence, and confocal laser scanning microscopy were used to analyze the relationship between DMT1 and amyloid beta (Aβ) and their distribution in senile plaques. 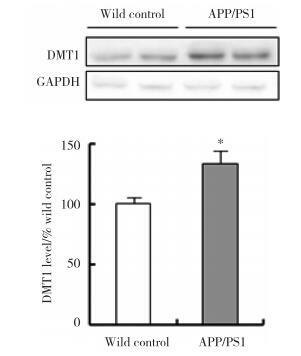 Western blotting was used to analyze DMT1 protein level in the APP/PS1 transgenic mouse cerebellum.Results DMT1 and Aβ were mainly located in the amyloid plaques, which were predominately located in the molecular layer of the cerebellar cortex of the transgenic mouse. Only a few plaques could be seen in the Purkinje cell layer and granular layer. 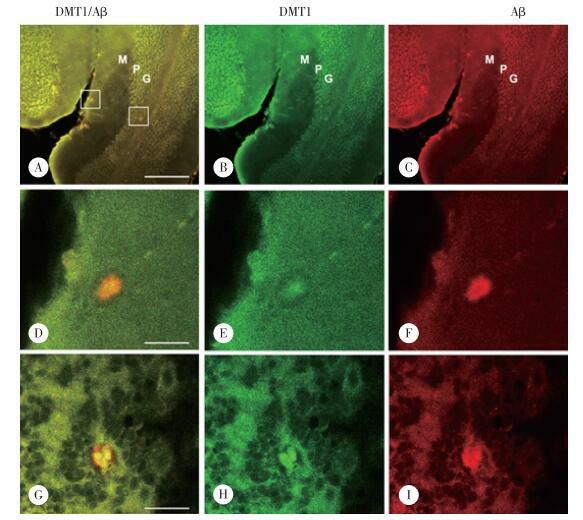 Confocal laser microscopy revealed the DMT1 and Aβ were co-localized in senile plaques.Conclusion The abundant expression of DMT1 protein suggests that DMT1 and the divalent metal ions that it transports might be involved in the formation of Aβ senile plaques and other pathological processes in the cerebellum in Alzheimer's disease. LEE JY, MOOK-JUNG I, KOH JY. Histochemically reactive zinc in plaques of the Swedish mutant beta-amyloid precursor protein transgenic mice[J]. J Neurosci, 1999, 19(11): RC10.